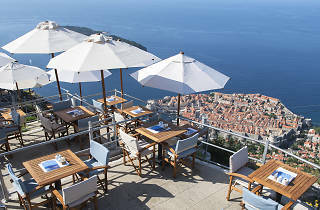 Passengers arriving at the cablecar station atop Mount Srđ can take advantage of this café-restaurant with the jaw-dropping view below, the Old Town, Lokrum island and, off to the right, a stunning sunset. 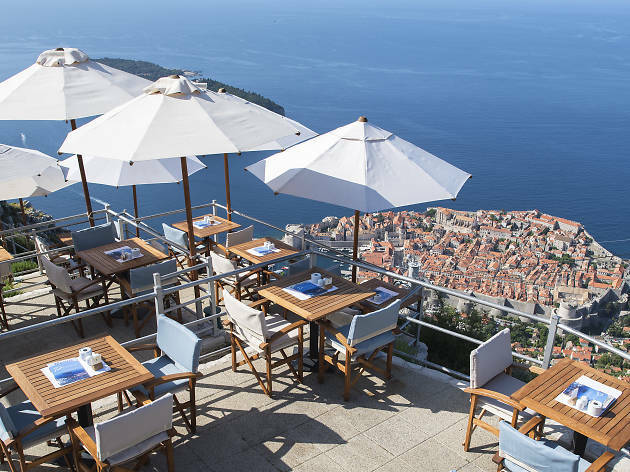 A lot of people stop by just for a coffee or beer but it's worth considering the food menu, which offers good-quality Mediterranean food, reasonably priced for the jaw-dropping location. You can opt for a full Panorama plate of swordfish, sea bass and calamari, Dalmatian ribsteak or a simple pasta dish or salad. Desserts include a Panorama cup of fruit salad, amaretto liqueur and ice-cream. There are sandwiches (steak, club, ham-and-cheese), burgers and breakfasts too.